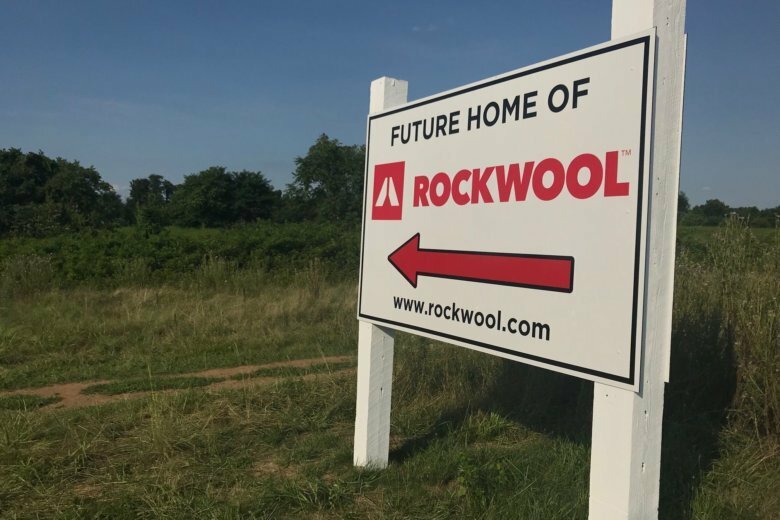 The Rockwool company, which is building a controversial insulation plant in Ranson, West Virginia, has been cited by the state environmental agency for failing to ensure against stormwater runoff. In a notice of violation from the West Virginia Department of Environmental Protection, the Denmark-based company was cited for seven “unsatisfactory” conditions, among the 17 permitted items surveyed during a Sept. 11 inspection. The controversial factory is being built 12 miles from the Loudoun County border, in a former apple orchard in Ranson, West Virginia. Located near state Route 9, the factory will melt rocks into molten lava in the manufacturing of stone wool insulation. Since construction on the factory broke ground in July, neighbors said they were blindsided to learn the 24-hour factory would include several stacks — one being 21 stories high — and expressed concerns about what will spew from them. “Polluted stormwater runoff can harm or kill fish and other wildlife. Sedimentation can destroy aquatic habitat and high volumes of runoff can cause stream bank erosion,” said the agency. Runoff from the Rockwool site would travel to Rockymarsh Run and eventually the Potomac River, according to the inspection report. While sediment deposits were discovered during the inspection, “sediment laden water did not leave the…site,” according to the environmental agency. In the violation notice, Rockwool was criticized for failing to establish a secure perimeter for stormwater and not properly maintaining water drains that would carry away stormwater. Critics of the factory have expressed concern that Rockwool would be called upon to self-report emission violations. The WVDEP report cites the company for not reporting a large sinkhole that had developed in one of the site’s storm basins. The company “Failed to report noncompliance, which may have endangered health or the environment, to the designation WVDEP spill alert telephone number,” according to the report. Rockwool downplayed the significance of the “unsatisfactory” inspection. “It is common for construction sites to need to make improvements based on DEP inspections,” the company said in its Facebook post. Rockwool said it will hire an external specialist to perform regular audits to ensure construction is in full compliance. In the unattributed Facebook post, the company said: “We think it’s important to be transparent with our neighbors when improvements are needed,” and said it is already taking action to remedy the problems. When completed, the facility is expected to provide 150 jobs. The company expects the factory to be operational by 2020.